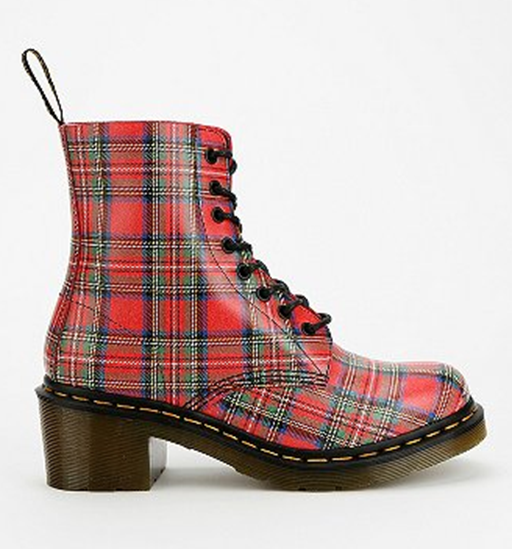 Today's So Shoe Me is the Clemency Tartan Plaid Fold-Over Eight Eye Boot by Dr. Martens, $140, available at Urban Outfitters. Punk up your life in these classic tartan ankle boots by the grunge experts at Dr. Martens. Get glad for plaid this fall with a chunky rubber soled heel that adds a little bit of height and a totally 90s silhouette to this classic lace-up. This signature red print checks off the pinch of plaid you'll need to stay on trend this fall. Pair these iconic yellow-stitched boots with a shredded sweater dress and a utilitarian camo jacket for the grunge ready weekend look this fall. So Shoe Me a pair of tough tartan boots that will add the perfect pinch of plaid to my everyday style this fall.